The new Mercedes-Benz GLC 300 4Matic Coupe exemplifies dynamism and versatility. A vehicle that complements your active lifestyle requires a financing plan that matches its characteristics, one that also allows you to enjoy affordable monthly instalments, flexible end of agreement options, a guaranteed future value for your vehicle, as well as a wide range of insurance products. 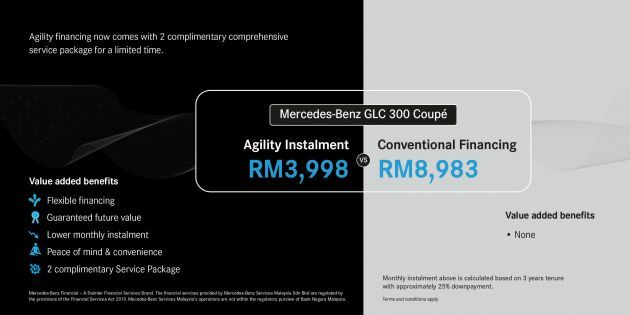 With installments starting from RM3,998*, Agility Financing is the perfect companion on your journey into Mercedes-Benz ownership. 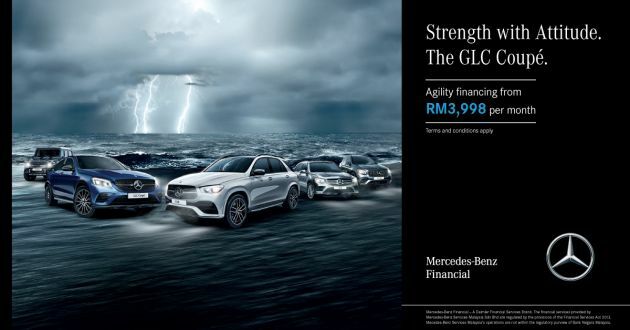 With flexible packages available, it’s as easy as choosing a financing package that best suits your needs, and Mercedes-Benz Financial will take care of the rest. Now for a limited time, all Agility Financing contracts come with two complimentary comprehensive service packages. Perfectly tailored for the individual who seeks value, unrivalled benefits and peace of mind at the wheel, indulge in the advantages of Agility Financing while being assured that your prized possession is well taken care of by Mercedes-Benz certified and trained technicians with genuine spare parts at their disposal. This exclusive campaign ends on April 30, 2019, and you can register your interest now or head on over here to find out more. Alternatively, you can call 1-800-88-1133 or speak to a finance and insurance executive at your nearest Mercedes-Benz Autohaus. *Monthly instalment above is calculated based on a 3 years tenure and downpayment of approximately 25% for the Mercedes-Benz GLC 300 4Matic Coupe. Terms and conditions apply.